Is your company suffering from audit fatigue. Too many audits? Is your company suffering from audit fatigue. Too many audits? Is Your Company Suffering From Audit Fatigue? Are We Putting the Cart Before the Horse? HomeWhat’s NewCompass ArticlesIs Your Company Suffering From Audit Fatigue? Many companies today are suffering from safety system audit fatigue, and they don’t know what to do about it. Allow me to explain. Without a doubt, the audit is the measurement method most commonly used to assess safety system performance. While some companies that use this method receive good prevention direction for their efforts, there are many that do not. Why? Because the value yielded by health and safety management system auditing depends upon the frequency of its use. As companies audit year in and year out, the useful information they obtain diminishes with each passing year (providing they are taking action on the findings of previous audits). After awhile, the audit results become very predictable leading to a condition we call audit fatigue. 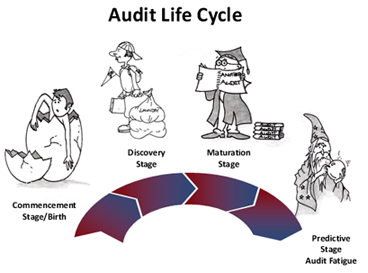 The figure below (Exhibit 1) describes what we call the audit life cycle. At some point, a company decides it’s time to develop a safety program. We call this the Commencement Stage. Later, they decide to conduct their first audit (the Discovery Stage). At some point in the future, they audit again. They may audit a number of times, and with each audit, they obtain value and improve their program (the Maturation Stage). Finally, there comes a time when many companies find that their measurement approach is no longer providing them with significant value. They have reached the Predictive Stage. If your company is at the predictive auditing stage, it’s probably time to make some changes in the way you measure your company’s safety performance. There are several factors that need to be considered when using the audit as a primary measure of safety performance. The audit process assumes that there are defined safety elements and sub-elements that all companies must possess in order to achieve good safety performance. In the 1970’s, Dr. Dan Petersen participated in a study that looked at the relationship between high audit scores and bottom-line safety results. This was a 10-year study sponsored by the Association of American Railroads. Interestingly, the study concluded that high audit scores partially correlate with improved legislative compliance, but don’t necessarily correspond to improved safety performance. On the other hand, the study identified a strong correlation between success in health and safety and positive scores on a perception survey. Since this study, there have been a number of others that have come to similar conclusions. Consider what it really takes to achieve a high level of safety performance. Exhibit 2 lists some of the key factors that influence this desirable outcome. Most audits do a pretty good job of assessing job factors. Depending on the detail required by the audit and the competence of the auditor, a number of organizational factors may also be adequately assessed. Audits do not measure human factors such as trust and workplace norms. Therefore, many factors that contribute to world-class health and safety are not measured by audits and other common methods of safety measurement. 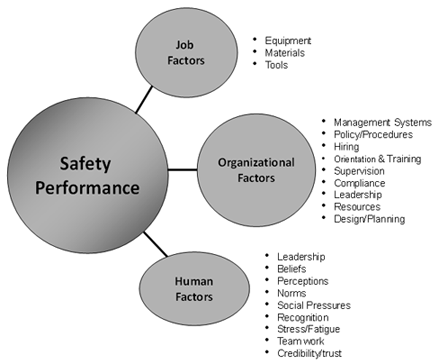 Organizations seeking to achieve world-class safety cannot do so unless these human factors are measured and addressed. For many companies, the audit results suggest that there is little or no room for improvement. Companies that are guided solely by audits are often misled and, predictably, they fall prey to unexpected safety disasters. Many large corporations such as British Petroleum and Union Carbide will attest to this fact. In order to avoid these unpleasant surprises, companies have to consider all of the factors contributing to safety performance, including, and especially, human factors. One of the best ways to do this is to employ alternate measurement tools such as safety perception surveys. Compass has a cure for audit fatigue. If people are truly a company’s most important resource, why do companies spend so little time asking their employees what they think about their work? Some companies spend more time poring over accident statistics and graphs and reacting to accident trends than on doing what most corporate policies promise to do-get their employees involved. All too often we hear the employee’s common refrain, “Management is not interested in what we have to say. They are only interested in the bottom line. Successful, profitable organizations have learned that the way to improve their bottom line is to problem-solve by tapping into the collective knowledge of employees. Such organizations actively seek information from their workers on how things can be improved. Rensis Likert, a pioneer of the survey approach, used surveys to measure attitudes, perceptions, and motivations in order to help improve company productivity, quality, and service. Likert found a positive correlation between attitude and corporate profitability, growth, and return on investment. Should you doubt the importance of corporate culture, consider Exhibit 3. In it are the results of a 1977-1988 study described by J. P. Kotter and J. L. Heskett in their book, “Corporate Culture and Performance.” The study clearly shows that companies with performance-enhancing cultures significantly outperform companies that do not have performance-enhancing cultures. The above findings apply equally well to safety. Employee input is needed in order to identify what is or is not working in the health and safety management system. Without input from employees, it is not possible to improve a corporate safety culture. Measuring workplace culture is a key factor in improving safety performance, and many commonly used methods of safety measurement do very little to assess cultural elements in the workplace. By contrast, safety perception surveys not only identify all the same factors that can be identified by audits, but also quantify organizational and human factors that audits typically do not even measure. For this reason, safety perception surveys are invaluable in helping companies to identify the factors that influence safety performance and, therefore, safe employee behaviour. Management cannot lead effectively without the information that only employee perceptions can provide. Management needs to know what is really happening inside the organization and inside the hearts and minds of their employees. To influence behavioural change, the organization needs to solicit employee perceptions on all of the factors that affect those behaviours, both bad and good. Safety efforts that only focus on some performance-influencing factors only get a part of the picture. Why Are Perception Surveys Currently Under-Utilized? •costs associated with hiring a consultant who has the needed knowledge and resources. Compass Health and Safety Ltd. has attempted to remove these barriers. We have literally written the book on how to conduct safety perception surveys. We have developed a powerful web-based application that is specifically designed to meet the varying safety survey needs of different organizations. In providing these resources, the Compass goal is to ensure that the perception survey measurement approach is available to all who are interested in using it. Off-The-Shelf Surveys – Will They Work? There are some distinct differences that put Compass apart from other survey consultants. First, the key to achieving the maximum benefits from a safety perception survey is to make sure that the survey is asking the right things. In the author’s opinion, there is currently no one off-the-shelf survey suitable for use by all organizations. Every organization is unique, with special survey design needs. One company may have a fleet or employ contractors, while another does not. Questions about contractors would not apply to a company that does not employ them. One company may have a flat organization, with one location and little work diversity, while another may employ many workers in different positions and multiple locations. Reporting parameters need to differ for these organizations. Some companies have visible senior management involvement, while others, due to factors like geography, must find other ways to involve them. Some companies have implemented behaviour-based safety and want to find out how employees think the program is working; other companies are a long way from implementing such programs. Because the safety profiles and needs of different organizations can be so different, survey statements that are appropriate for some companies are often not appropriate for others. The survey statements used by your company need to be unique because your company is unique. Don’t set your company up for failure by administering a survey that is not suited specifically for you. One-size-fits-all surveys are a compromise, an attempt to find a common denominator that fills the needs of all companies. It forces the companies that have advanced safety systems to come down to a basic level. Alternatively, companies at a basic level may feel strained to reach a level that they may be years from achieving. As a result, generic surveys often fall short of meeting the real needs of most companies. Second, Compass believes that surveys should solicit respondents to comment on questions or statements. The scores given for each question quantify employee perceptions. Comments qualify the employees’ scores by indicating why they responded as they did and providing insight into how to improve. Without the comments, you have only part of the information you need to take action and ultimately improve your safety program. If you are self-administering a survey, this information is critical to realizing your needs. In addition, the database you use to manage the survey data needs to be capable of capturing these comments so they can be analyzed along with the scores for each statement. Compass Health and Safety Ltd. encourages the self-administration of surveys, thereby saving companies significant consulting fees. Again, our goal is to help make this measurement approach as popular a choice as auditing. 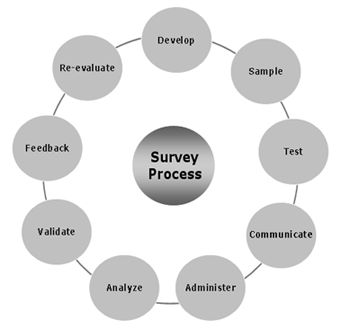 To accomplish this, we are attempting to provide organizations with the ability to conduct their own surveys. Exhibit 4 illustrates the safety perception survey process. If you follow the process, you will have a positive surveying experience that will elicit useful information from your employees. If you miss one or more steps, you will fail, and may in fact do more harm than had you not surveyed at all. The safety perception survey process raises employees’ expectations that they will be heard. Do not raise the expectations of staff and then fail them by eliminating any of the steps. Now, more than ever before, employee opinions and perceptions play a key role in the success of an organization. As companies start to realize that the solutions to most of their problems are already well known to their stakeholders, more and more companies will see the value in soliciting opinions and perceptions from employees, customers, and constituents. It is no exaggeration to say that management cannot lead effectively without this information. Safety leadership is no different. Many of the factors that affect quality, productivity, and service will also affect safety. Safety perception surveys are a key tool for understanding these factors. We have worked with too many companies whose measurement systems have lulled them into thinking their safety systems were fine – until a catastrophic event destroyed their happy illusion. To make the workplace safe, management needs to know what is really happening inside the hearts and minds of its employees. If your current culture fosters unsafe behaviours and procedural shortcuts, a perception survey can help you to identify why they are happening. If your current corporate culture influences employees to work safely even when the boss is not around, then congratulations! You have achieved a key prerequisite of a world-class safety system. A safety perception survey will help you maintain this high level of safety performance.